The mission of the California Wolf Center is to increase awareness and conservation efforts in protecting and understanding the importance of all wildlife and wild lands by focusing on the history, biology and ecology of the North American Gray Wolf through education, exhibition, reproduction of endangered species and studies of captive wolf behavior. As part of the education mission, multiple experiments in support of distance education were undertaken, with an objective to evaluate the results and usability of the technology that had been used. A question was whether bidirectional interactive video/audio could become one of the mainstream activies of an education/reseach facility such as the California Wolf Center. 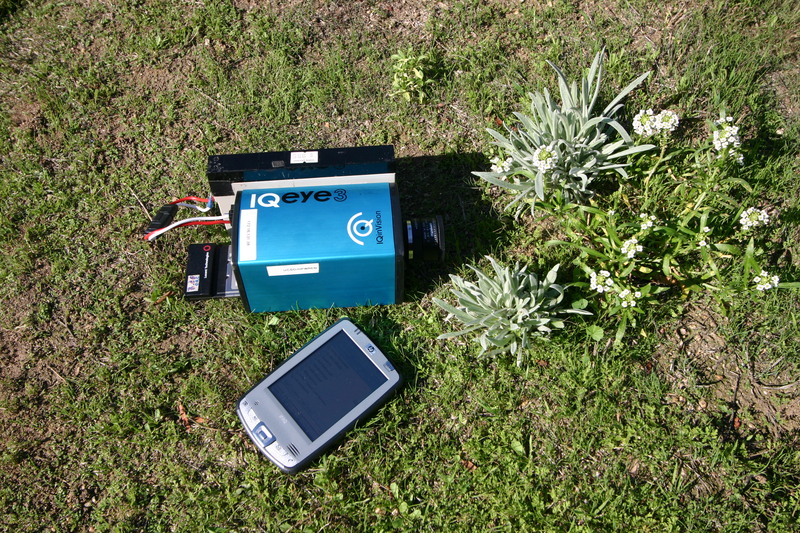 The initial test consisted of a self-contained IQeye3 camera with attached 12 Volt Gelcel battery, and built-in wireless card, for the image stream. This was used alongside a PDA to support a bidirectional audio conversation by using skype. 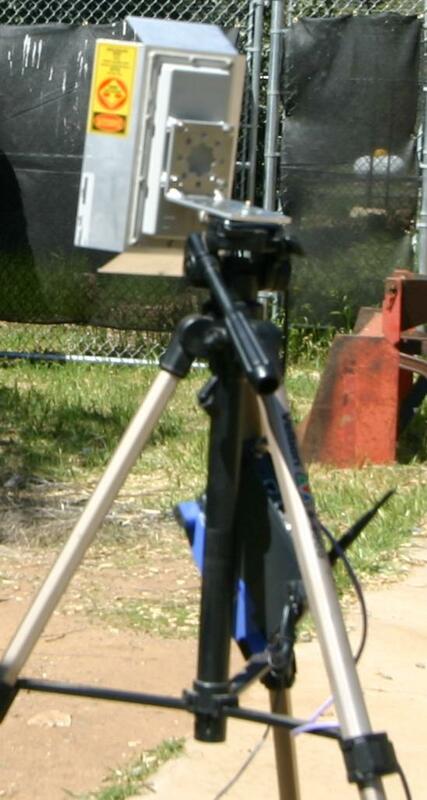 The setup was supported by a wireless access point with a directional antenna. The initial try with this technology revealed many things we had nor thought of prior to a test run. It affirmed that technology of this kind has the potential to be very useful for remote education presentations once refined, which we attempted in a subsequent demonstration. In this setup we did not have zoom or autofocus capability with the camera and we learned this was of detriment to the quality of the presentation. Without zooming, it was difficult for the person on the other end to identify specific wolf behavior we were trying to highlight. While this camera provided a superior image quality as compared to video, the rather limited frame rate made for a choppy image stream. This made it difficult to see fast or continuous movement, something we decided to try and remedy. The setup required the person giving the virtual tour to carry 2 pieces of equipment: the camera and a PDA for the voice comminication. The camera was awkward to hold as there was no strap and it became heave after only a few minutes. Having a battery glued to it's side added to this issue. It also made it more difficult to hold the camera steady. The PDA worked well for voice if there was no wind, but when the wind picked up, the sound deteriorated quickly, not the least as the built-in-only microphone did not have a wind shield. 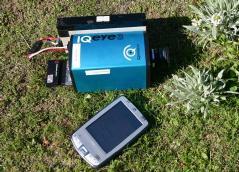 Melinda Booth utilizing the IQeye3 camera to communicate with remote participants. Various remote locations were tested, including at the National Science Foundation in Washington, DC, and overseas. On our second try, we utilized a laptop, digital video camera and a headset. The laptop was carried in a backpack and the cords from the video camera and headset did not get in the way, they were tucked into the backpack as well. The sound quality with the headset was fantastic and hands-free. The camera was light-weight and easy to carry. It offered a screen display or eyepiece for the presenter to use with the screen being the by far the superior option. It allowed seeing what was being presented as a video stream, while keeping the local environment observable at the same time. Something that is highly desirable, especially when presenting from inside the wolf enclosures. Having the ability to zoom in and out to follow the wolves was of added advantage. It made it easier to communicate what exactly was being shown and why. It also made it easy to answer questions received with a visual to go along with a verbal answer. It was still important to try and hold the camera steady, and a tripod would be useful in the future to help with that. This demo was by far easier for the presenter to use and based on initial feedback from those on the other end, it was easier for them to understand what they were seeing. All in all it felt significantly more interactive. The applications for this technology are endless, a likely initial application for the California Wolf Center being to begin with remote education programs for animal behavior students and virtual tours for students who cannot afford to visit on a field trip. In addition it may be possible to expand the application to offer remote visits some donors and perhaps have a weekly segment on a news show checking in with the wolves at the Center. In this setup, Melinda is utilizing a laptop in the backpack, connected to a Digital Video camcorder via a firewire cable, using OrangeWare's WebCamDV to interface to Skype. A headset with microphone is being used for the audio. 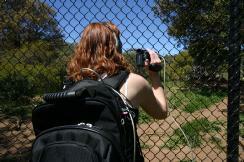 The camcorder-local screen gave her immediate feedback of what the audience is watching. One feature of the new technique I think was most interesting was the ability to become the researcher. One person was approaching the enclosure and the one person was a familiar individual. I had the opportunity to see the wolves react in real-time in a way only the researcher would normally see. I thought we invoked curiosity in the wolves about the observer, rather than a defensive behavior caused by the invasion of a group or an unfamiliar stranger. I was granted a wolf researcher's understanding of wolves as I was directed to specific details that I, a non wolf researcher, would not have noticed while at the same time participating in an interactive discussion about the activities played out in real-time. In the second setup the action flowed consistently at more frames a second, while the former setup was more like a fast-passed slide show rather then a scene-by-scene action encounter. 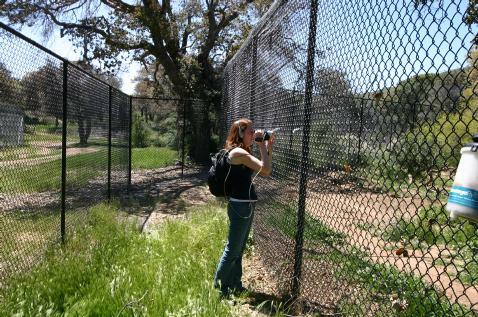 Melinda, even through the fence, was able to zoom in and take me directly to where the action was occurring or move to a location that provided a better view. 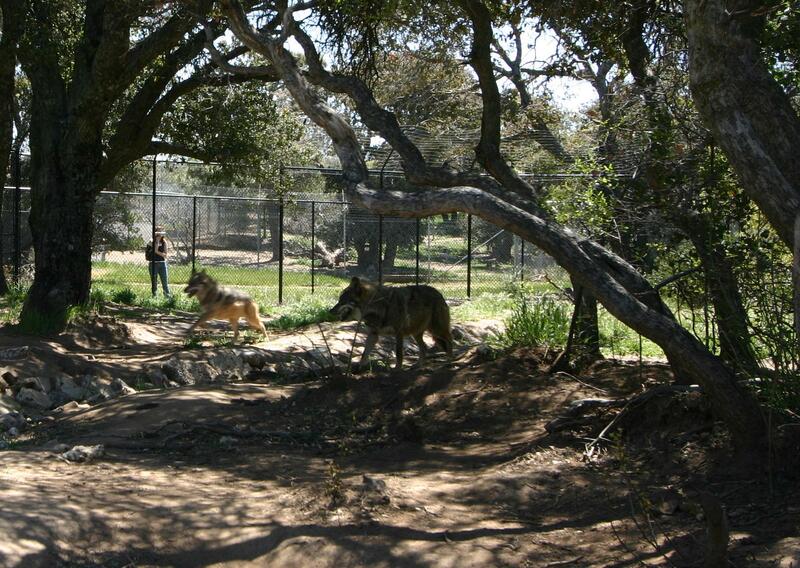 Able to split out a single wolf from across the enclosure without unduly disrupting the normal and regular activity. The ability to talk directly to Melinda or another researcher is still an integral function to such educational activities, and included the opportunity to direct her attention to a specific detail on the screen and ask for further explanations. Distance education techniques like this provide a remote observer with an ability to participate otherwise only appreciated by Wolf Center Researchers, with the least impact on the behavior of these beautiful animals. View of two of the wolves running, while an overseas participant is watching in real-time, and while listening to a California Wolf Center educator. While it produced usable results, various lessons-learned for these real-time distance education technologies were observed, which may result in further changes of the setup. For example, an issue to be addressed is to avoid overheating the laptop in a closed backpack by perhaps creating an open-air version. It was also determined that having a permanent access point, possibly with multiple antennas pointed to various wolf enclosures, would help making the use of this technoloy more attractive. "Technology and collaborations with HPWREN allow us to broaden our footprint,"said Patrick Valentino, Executive Director at the California Wolf Center. "When we can use bidirectional interactive video and audio technology for distance education, we increase the value and effectiveness of our education programs. Our ability to make a difference grows exponentially."